Butler's Maria Lucas (1) sets up a teammate during the Golden Tornado's 3-0 volleyball loss to Pine-Richland Tuesday night. BUTLER TWP — Pine-Richland volleyball coach Amanda Fetter took a big sigh of relief. “Let's just say we're happy this one is in our rearview mirror,” she said. A few points in two sets made the difference for the Rams against a feisty Butler team that had to shuffle its lineup at the last minute because of an injury suffered during the junior varsity match. The Golden Tornado led the first set 24-19, but Pine-Richland rallied for a 27-25 win. In the third set, Butler again had set-point, but the Rams stormed back to take that set and the match 27-25, 25-20, 26-24. Butler had to play without starting libero Sophia Lucas, who injured her knee late in the JV match. That forced Meghan Lucas to move Hope Fiorina to libero and Maria Lucas to more of a setting role. The Golden Tornado didn't really miss a beat. Butler surged ahead 24-19 in the first set after a kill from Heidi Gross, but Pine-Richland rolled off six straight points for a 25-24 advantage. After a kill by Maria Lucas knotted the score again, the Rams got a kill and an ace to escape with a first-set win. Pine-Richland cruised in the second set and appeared to have the third set in control before Butler made a rally. Tabitha Walker banged home a kill to make it 24-23, but a couple of errors and a kill by Hannah Cottrill ended the match. Butler was at a substantial height disadvantage against Pine-Richland, but was still able to nearly match the Rams kill-for-kill at the net. “We're not big and we're playing in a section of big kids,” Meghan Lucas said. “We have to be smart, we have to be able to control the ball, and we have to serve aggressive. When we serve aggressive, we're going to take the chance of missing some. We missed more serves than I would have liked tonight. 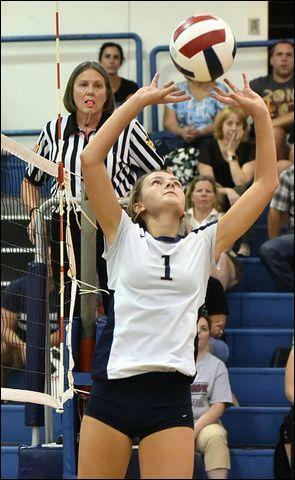 Walker had a big night for the Golden Tornado with eight kills, nine assists and 19 digs. Maria Lucas also had eight kills, nine assists and 10 digs and Fiorina added 20 digs and three aces for Butler. Anna Jurkovec had 14 kills to lead Pine-Richland (3-1, 2-1), who were coming off a 3-1 loss to North Allegheny. The Rams have also swept Seneca Valley 3-0 this season. Last year, Butler beat Pine-Richland at home. “It's always difficult to come out here and play,” Fetter said. “There's something about this gym. It's always hard to win here.